This is only the second set of aftermarket open-spoke wheels made available to us. While the measurements for the wheels are perfect for 1/72nd scale, the detail could be a little better. The rims and tires seem to be very skinny to my eyes, and I feel the competing set from Calibre72 is superior to this one. 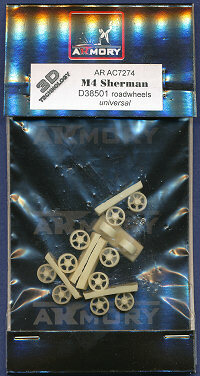 It also would have been nice to have one or two spare wheels included in the set as well. The mounting points in the center of the hub are generic, and can be easily modfied to fit any available Sherman kit.